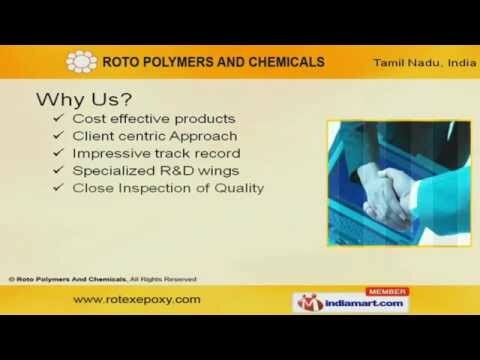 Welcome to Roto Polymers and Chemicals Manufacturer & Exporter of Chemicals & Polymers Established in the year 1999 at Chennai, we are an ISO 9001:2008 & QMS certified company. Our client base is spread across Electrical, Adhesives & other industries.Our client centric approach, impressive track record & close Inspection of quality have made us a pioneer in the industry.We are engaged in offering Sealants, Brake Blocks, Crusher Backing Compounds, Epoxy Grouting, Floorings & Paints.Our Battery & Traffic Loop Sealants are one of the best in the industry. We are a well known manufacturer of Railway Brake Blocks & Disc Brake pads. Our epoxy crusher backing compound are highly compressive to facilitate heavy duty crushing.We also manufacture Epoxy Grouting, Floorings & Paints like Injection Crack Grouting, Epoxy Paints, High Gloss Epoxy Coatings & Epoxy Floor Coatings.Along with that we provide Epoxy Systems for Abrasive, Marble Granite, Potting & Encapsulation Industry.